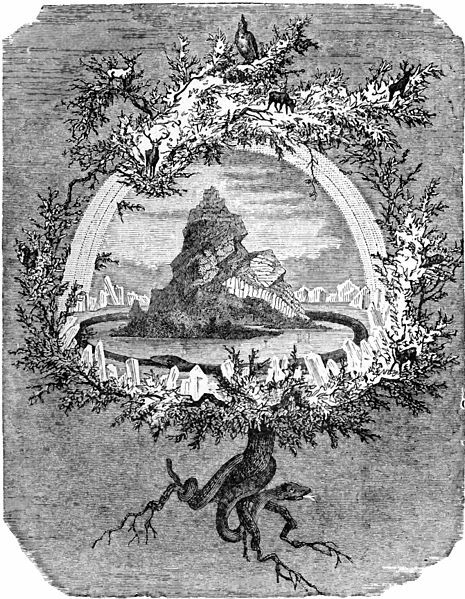 Yggdrasil, which means something like “dreadful mount”, was the cosmic ash tree in Norse mythology. It was the largest and most impressive tree in all of creation, supporting nine realms. These nine realms were formed by Odin and his brothers Vili and Ve. They killed the giant Ymir and used his body to create the cosmos. Midgard (“Middle Earth”) was the world of humans, also called Mannaheim (“Home of Men”). It was made out of Ymir’s eyebrows, and to populate it, Odin and his brothers created the first humans, Askr and Embla, from a tree trunk. Heimdall, in the guise of Rig,later divided humanity into three social classes: slaves, peasants, and aristocracy. Midgard was surrounded by a sea, and coiled around the edges of that sea lay the mighty snake Jormungand, also called the Midgard Serpent. Asgard was the home of the Aesir, one of the two classes of Norse gods. It was accessible via a rainbow bridge, called Bifrost, which was watched by the god Heimdall. Around it stood a great wall, built by the giant Hrimthurs in the guise of a man, but it was incomplete,because Loki sabotaged Hrimthurs’ efforts so that the gods did not have to pay him for hi swork. In Asgard stood the grand halls of all the Aesir, as well as Valhalla, the splendid hall where the heroic dead, the Einherjar, feasted and drank and awaited Ragnarok. It was also the location of the Vigrid plain, where the final battle of Ragnarok was destined to take place. Jotunheim was the realm of frost and mountain giants. Located next to Asgard, it was separated from the realm of the gods by a huge, dense forest called Mirkwood. It was surrounded by Utgard, a stronghold whose name literally means “outyard”. Thor and Lokionce traveled to Utgard to compete with the giants there in contests that turned out to be rigged. In fact, Utgard itself turned out to be an illusion in the end. It was home to Utgard-Loki, a menacing and devious giant (who, despite his name, did not seem to have any connection to Loki). Helheim, also known simply as Hel, was the realm of the dead. It was named after andreigned by Hel, the grim daughter of the god Loki and the giantess Angrboda. Most people ended up here after they died. Much like its mistress, it was a gloomy, dark place. It was guarded by the hell hound Garm, and accessed via a bridge called Gjallarbrú which allowed the dead to cross the river Gjöll. The maiden Módgrudr guarded this bridge. Niflheim was sometimes confused or identified with Hel. It was a cold place of mist and ice, and home to the dragon Nidhogg. Nine frozen rivers crossed it. It overlaps with the concept of Hel and Niflhel, and it may be that Hel was located in or near Niflheim. Svartalfheim was the home of the svartalfar, or dark elves. They are usually considered synonymous with dwarves, with certain dwarves often described as living in Svartalfheim. Svartalfheim was an underground realm, essentially a series of caverns, mines, and small settlements where the dwarves lived and worked. The inhabitants of Svartalfheim were described as dark, short, and ugly, but excellent craftsmen whose skill and expertise was even sought by the gods themselves. Alfheim was the realm of elves and the home of Freyr, their lord. Not much informationabout it survives, but it was described as a splendid realm, airy and bright. It was in many ways the direct opposite of Svartalfheim, just as its inhabitants were the opposite of dwarves.They were light and beautiful, and associated with magic. Muspelheim was a land of fire. It lay to the south of Niflheim, and where the two met was a great rift or void, called Ginnungagap. The meeting of fire and ice here resulted inthe creation of water, and thus life. Muspelheim was home to the fire giants, ruled by Surt.During Ragnarok, they would join with Loki’s forces, and it was they who would break the Bifrost bridge and set the world aflame. Vanaheim was home to the Vanir, the second class of gods in Norse mythology. The Vanirwere more peaceful than the more warlike Aesir, but the two sides came to blows and there was a war. It ended in a peace treaty and exchange of hostages: the Aesir Hoenir and Mimirwent to live with the Vanir, and the Vanir sent Njord and his twin children Freyr and Freyjato Asgard. Yggdrasil’s branches supported and spread out over all of these realms. It was supported by three great roots. One of these descended down into Jotunheim, where Mimir’s Well stood. It held Mimir’s wisdom, and Odin famously sacrificed one of his eyes in return for a drink from its waters. The second root was embedded near Asgard, beside Urd’s Well. Thiswell was tended by the Norns, and the gods met here every day to hold counsel together.The last root ended in Niflheim, next to a well called Hvergelmir, which is the source of nine rivers. The dragon Nidhogg gnawed constantly at this root, and he would eventually bite all the way through it during Ragnarok. On top of Yggdrasil lived a mighty eagle called Vedrfolnir. The tree was also home to a squirrel called Ratatosk who ran up and down the huge trunk and carried malicious messages to and fro between Nidhogg and Vedrfolnir. There are possible connections between Yggdrasil and Hoddmímis holt, the place where the two humans Lif and Lifthrasir hid to survive Ragnarok. 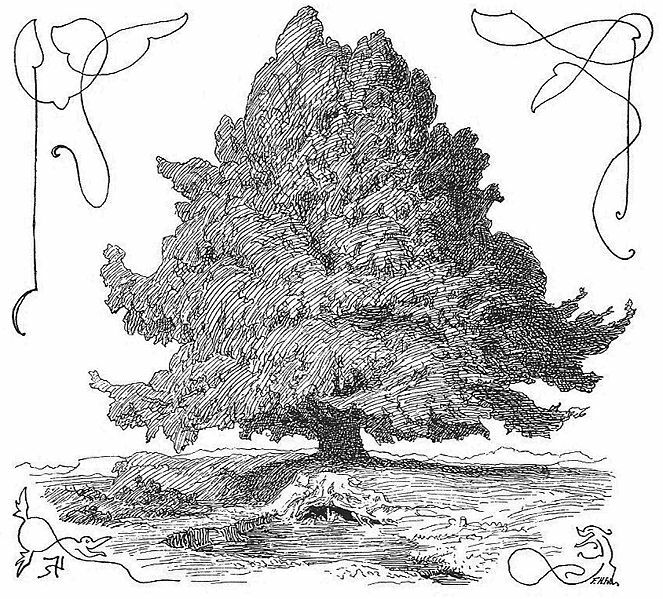 Yggdrasil was an important part of Norse mythology, not just as a support for the nine realms but also as a source of magic and power in and of itself. Odin hung himself from Yggdrasil for nine days, impaled on his own spear, in order to gain wisdom and secret knowledge of the runes. This echoed the concept of the hanging tree in Norse society. Prisoners of war were often hanged from sacred trees as a sacrifice to the gods. Odin and Tyr, especially, were both honored by such sacrifices. Copyright © 2012-2016 Melissa Snark. All rights reserved.